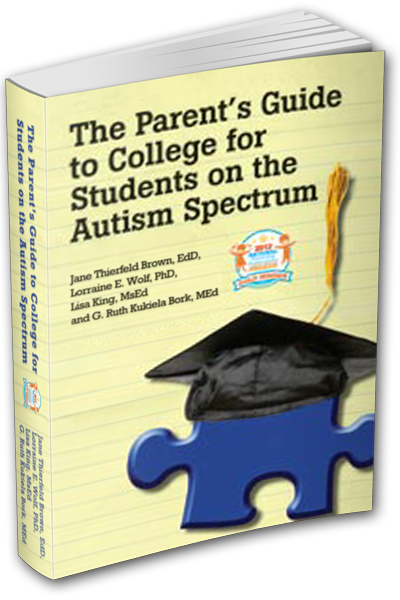 Providing college and career resources and training for students, parents and professionals in the autism community. Sending a son or daughter off to college is daunting and fear-provoking experience for most parents, but if your child has an autism spectrum disorder, the challenge is magnified many times over. Even high-functioning students with excellent academic preparation face difficulties in higher education, primarily related to communication, social skills, and sensory-based issues. For many, the accommodations and special interventions that supported them in high school will no longer be available on a college campus. This parent-friendly book, made especially so because it is written by parents, who also are autism professionals, takes the fear and mystery out of the college experience. Learn how to select the right campus, how to work with Disability Services staff, what legal protections apply, how to prepare your son or daughter to be an effective self-advocate on campus, what assistance can be reasonably be expected from residence hall managers, faculty, and much, much more. Lorraine Wolf, Ph.D. is director of Disability Services at Boston University, where she also holds faculty appointments in psychiatry and rehabilitation sciences. With over 20 years of experience working with children, adolescents, and adults with neurodevelopmental disorders,Dr.Wolf has published and presented extensively on issues related to students with attention and learning disorders, psychiatric disabilities, and autism spectrum disorders. Jane Thierfeld Brown, Ed.D. is director of Student Services at the University of Connecticut School of Law. She has worked in Disability Services for 27 years. She consults at many higher education institutions and is a frequent keynote speaker at conferences on Asperger Syndrome. Lisa King, MsEd is Co-director of Higher Education and Autism Spectrum Disorders, Inc. As a Disability Specialist in higher education she has worked extensively with students with Aspergers and Autism Spectrum Disorders for over 20 years. She is a frequent presenter and trainer, locally and nationally on topics related to best practices for working with students on the spectrum in higher education settings. G.Ruth Kukiela Bork, M.Ed., is dean and director of the Disability Resource Center, Northeastern University. Dean Bork’s professional involvement in disability affairs and advocacy spans 34 years.She is a founding member of the Association on Higher Education and Disability (AHEAD). Dean Bork has written and spoken on a wide range of disability-related topics.